Andy Monkhouse scored one goal and created another as second-place Bristol Rovers beat Macclesfield to close the gap on Conference leaders Barnet. Monkhouse opened the scoring just before half-time when he headed in after Jake Gosling's shot hit the post. After the break, the forward squared to Nathan Blissett who tucked in a second before Matt Taylor headed a third and Ellis Harrison scored a late penalty. Rovers move to within seven points of top spot, with Macclesfield third. "I thought we raised our game in the second half and we played a lot better. "I had a little pop at the boys at half-time, even though we were 1-0 up. I thought we had gears to raise. "It's difficult on the lads, having two games in three games. "But we were clinical in the second half, which was pretty pleasing." Match ends, Bristol Rovers 4, Macclesfield Town 0. Second Half ends, Bristol Rovers 4, Macclesfield Town 0. Attempt missed. Chris Holroyd (Macclesfield Town) header from the centre of the box misses to the right. Assisted by Scott Barrow with a cross. Attempt missed. Mark McChrystal (Bristol Rovers) left footed shot from the centre of the box misses to the left. Foul by Alex Grant (Macclesfield Town). Bradley Goldberg (Bristol Rovers) wins a free kick. Goal! Bristol Rovers 4, Macclesfield Town 0. Ellis Harrison (Bristol Rovers) converts the penalty with a right footed shot to the high centre of the goal. Penalty conceded by Scott Barrow (Macclesfield Town) after a foul in the penalty area. Penalty Bristol Rovers. Bradley Goldberg draws a foul in the penalty area. Substitution, Bristol Rovers. Bradley Goldberg replaces Matty Taylor. Substitution, Bristol Rovers. Ellis Harrison replaces Nathan Blissett. Dan Cowan (Macclesfield Town) is shown the yellow card for a bad foul. Goal! Bristol Rovers 3, Macclesfield Town 0. Matty Taylor (Bristol Rovers) header from the centre of the box to the bottom right corner. Assisted by Lee Mansell with a cross. 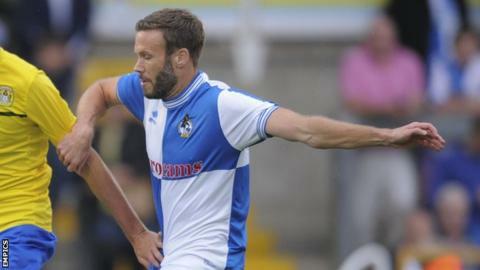 Andy Monkhouse (Bristol Rovers) wins a free kick. Attempt missed. Ollie Clarke (Bristol Rovers) right footed shot from outside the box misses to the right. Substitution, Macclesfield Town. Waide Fairhurst replaces Denny Johnstone. Goal! Bristol Rovers 2, Macclesfield Town 0. Nathan Blissett (Bristol Rovers) right footed shot from the centre of the box to the centre of the goal. Assisted by Andy Monkhouse. Substitution, Bristol Rovers. Ollie Clarke replaces Jake Gosling. Stuart Sinclair (Bristol Rovers) wins a free kick. Attempt missed. Matty Taylor (Bristol Rovers) left footed shot from outside the box misses to the right. Attempt saved. Matty Taylor (Bristol Rovers) right footed shot from the centre of the box is saved. Assisted by Jake Gosling with a cross. Alex Grant (Macclesfield Town) wins a free kick.